Many of us attend or get involved with a walk to support a family member or friend challenged by a specific diagnosis or condition hoping the fundraiser will help to create change. So, how can a RSDSA event be any different? Who participates? What can one expect? Where is it held? Do you have to walk to attend? Is it accessible? 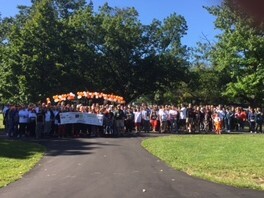 In 2016, RSDSA’s 1stAnnual Long Island CRPS/RSD Walk hosted 225 kids and adults, raising $25,000 despite the heat and humidity at Eisenhower Park in East Meadow, NY. Impressive as CRPS formally known as RSD (Reflex Sympathetic Dystrophy) is considered a “rare condition” under National Organization for Rare Disorders (NORD) a 501(c)(3) organization. Now imagine, not only meeting for the first time another individual living with Complex Regional Pain Syndrome but actually having a conversation about the medical, social and personal challenges with another who actually understands. To realize you are NOT alone is an awesome realization brought forth by a RSDSA walk event. Now jump to September 9, 2017. 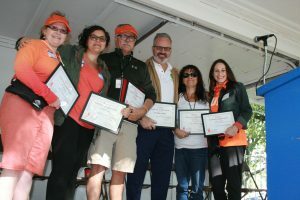 Despite the walk committee co-chairs living with CRPS, numerous flares and hospitalizations, RSDSA’s “2nd Annual Long Island CRPS/RSD Awareness Walk” came to fruition, attracting some 450 participants from NY, PA, NJ, RI, CT and Italy, raising over $53,000. “The RSDSA Mission is to provide support, education, and hope to everyone affected by CRPS/RSD while we drive research to develop better treatment and a cure”. Jim Broatch, Director and VP of RSDSA, opened the event by welcoming all who travelled near and far. After a few housekeeping points, Jim shared the origins of RSDSA, noting the incredible growth of the organization from its humble beginning back in 1984 from the kitchen table of 2 determined NJ moms. What an evolution. After thanking all the volunteers and event sponsors, Jim encouraged everyone to visit the raffle tables and take advantage of the wealth of information found in the “education and exhibit” tent before, after, and during the 2K or 5K accessible walk. Jim recognized Amanda from IL. as the winner of the tee shirt contest. Amanda’s design brought cohesion to the event by depicting how so many including her mom feel living with CRPS. After which, Jim introduced Rachel, daughter of co-chair Debbie to speak about “Living With a CRPS/RSD Parent,” which brought tears to many. Our special honored guest, Dr. Brian Durkin, a board-certified anesthesiologist with Pain Institute of Long Island, was the final presenter Jim introduced. To commemorate the day, a group photo was taken highlighting teams decorated in colorful team shirts, hats, wheelchairs, canes, scooters, crutches and painted faces. All stood together celebrating they are NOT alone. With spirits filled with hope, the walk was kicked off alongside Jim Broatch and the walk committee. Whether with a walker, or as a roller in a wheelchair or scooter, or with a cane/crutches, all were surrounded by a large group of support as they traveled around either the 2K or 5K paths with family and friends. Participants were encouraged to read as many educational signs they could find around the paths, while stopping at water stations welcomed by volunteers cheering them on. All were congratulated with an event medal at the finish line, which for many was an incredible sense of accomplishment. Throughout the event, attendees were able to gather a plethora of education and resources in the “Education and Exhibit Tent”. Nurse Beth along with her husband were truly key in setting up the education center for resource center. She keeps her focus on educational resources for those with CRPS/RSD as well as practitioners treating CRPS/RSD. Distinctive Dental Services of N.Y.
Massapequa Girl Scout Cadette Troop cheering on walkers while manning a water station and handing out orange necklaces, hand clappers, etc. However, none of this would be possible without the constant support of Jim Broatch, Executive VP & Director RSDSA and Samantha Anderson, RSDSA’s Special Event Coordinator. Stay tuned for information on RSDSA’s “3rd Annual CRPS/RSD Awareness Walk” in September 2018. But till then, THANK YOU to all our sponsors! Visit our Facebook page by clicking here.